There are three myths that inevitably pop up whenever the relative worth of various media are discussed: The book is always better, the adaptation is always worse, and sequels are always rotten. Taken together, they serve as a guide to the assumptions we make about our entertainment and our art. When it comes to videogames, the first two rules still rule supreme, but the third is nowhere to be found. Despite all the sequel-bashing that takes place with other media, a videogame sequel is a different case altogether. Rather than assume that a sequel is an innately inferior thing, often the opposite is true - we expect sequels to increase in quality. In fact, this assumption is so commonplace that we don't often stop to consider how radical it really is. Part of this is that there is a difference in how games do sequels than any other modern medium. Usually in other works, a sequel is an extrapolation - a type of physical extension that extends the scope of the original. It opens up what was formerly closed, like picking at a dried scab. The results are often messy: Happy endings are laid vulnerable to new developments, or are brushed away as continuity fluff. Characters who made it through the first go-through are killed off in the first reel, or vanish mysteriously, or turn out to be a robot. And in this scramble to add on additional stuff, the original can be grossly mischaracterized or misunderstood. Suddenly in Phantom Menace the Force is just a bad buildup of bacteria, and suddenly all that deep-sounding philosophy of The Matrix is revealed as actually just deeply-dumb. It isn't just that a sequel might take a beloved story in a weird direction, but that in its missteps, it drags the first one along behind it through the muck. But a sequel in a videogame doesn't necessarily work that way. There is no need to slap the one onto the other, suggesting a direct and chronological type of sequentiality. What it might do instead is reinterpret and reiterate, and serve as a mechanical sequel, rather than a narrative one. Here's a story that inspired several sequels: A princess is kidnapped by a horrible turtle man and an Italian plumber has to chase through several worlds to get her back. I could be describing any number of Mario games, from 1985 on to the present. Their stories are essentially the same, but their gameplay is worlds apart. Here is another: A disgruntled young man takes to a life of crime, and commits several car thefts. 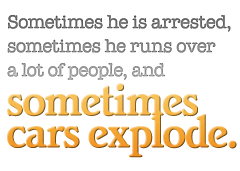 Sometimes he is arrested, sometimes he runs over a lot of people, and sometimes cars explode.